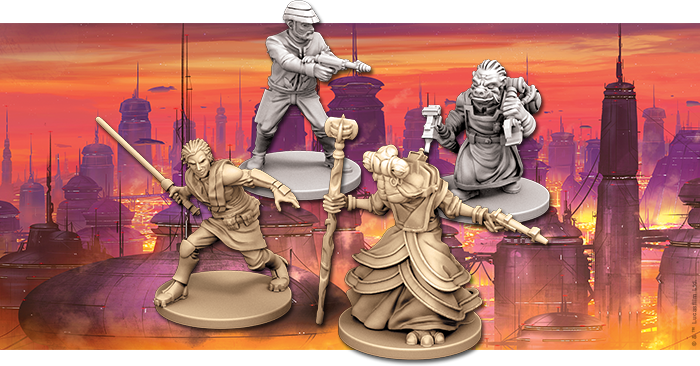 Here are all the painted miniatures from The Bespin Gambit boxed set, the latest expansion for Star Wars Imperial Assault: we have the heroes Davith Elso and Murne Rin, plus the Bespin Wing Guard and Ugnaughts. 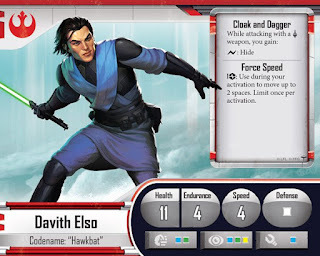 Last week, I posted pictures of all the associated Hero and Villain Packs, like Lando Calrissian. Between Lando, Davith, Murne, the Wing Guard and even the Ugnaughts, there are so many variations of blue. I hope it creates a sense of unity for the Bespin miniatures. 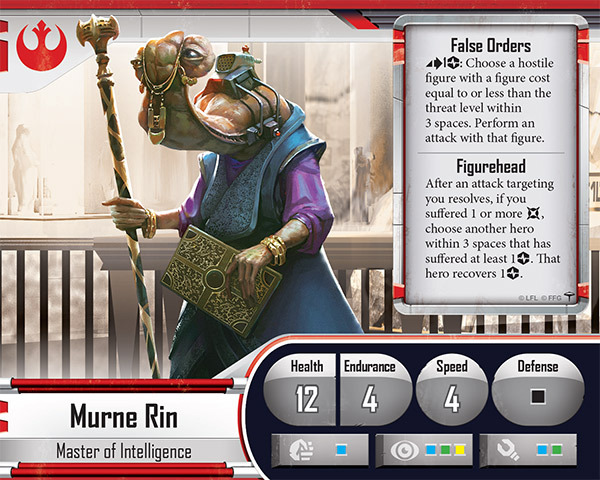 On first glance, I wasn't enthused about Murne Rin. She is supposed to be a diplomat of the Ithorian race. 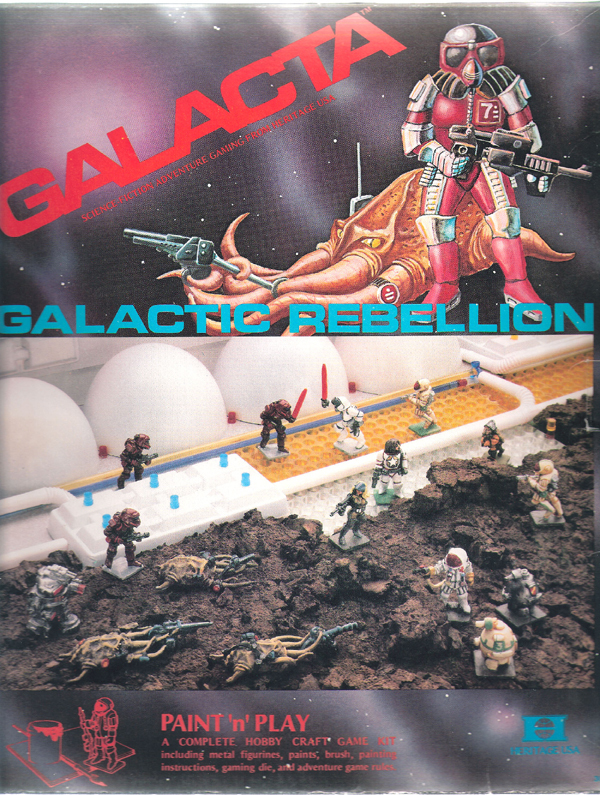 The original miniature, however, is an ugly mess of contradictions. Is she an action hero wearing a frilly prom dress? An ambassador brandishing a firearm? 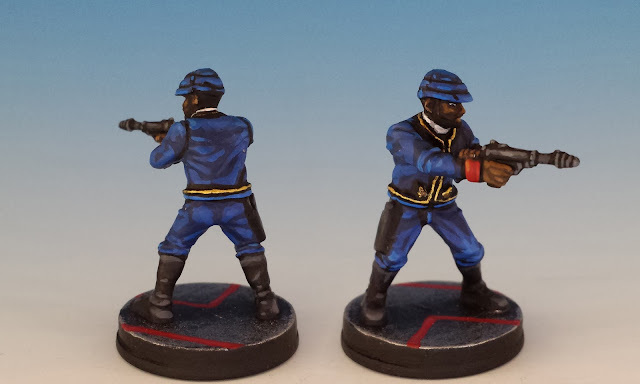 I decided to clean up the miniature with a few quick alterations. I cut away her over-sized wizard's staff, and substituted a simple rod of office. Then I ditched her blaster and replaced it with a gesturing hand -- after all, in Imperial Assault Murne's abilities are all about her diplomatic powers, not her sharpshooting. Although her frock is still a little ridiculous, now I'm much happier with the miniature. Davith Elso is a much better designed miniature -- this young Jedi's crouching pose carries tremendous action and personality. It also telegraphs his in-game abilities based on concealment and stealth. I think this is one of the best original sculpts that Imperial Assault has produced. I'm looking forward to seeing how he plays in the game. I'm a little confused by the Ugnaughts. I'm glad that these little blighters have been included in Bespin because they're a key part of the Bespin vibe. 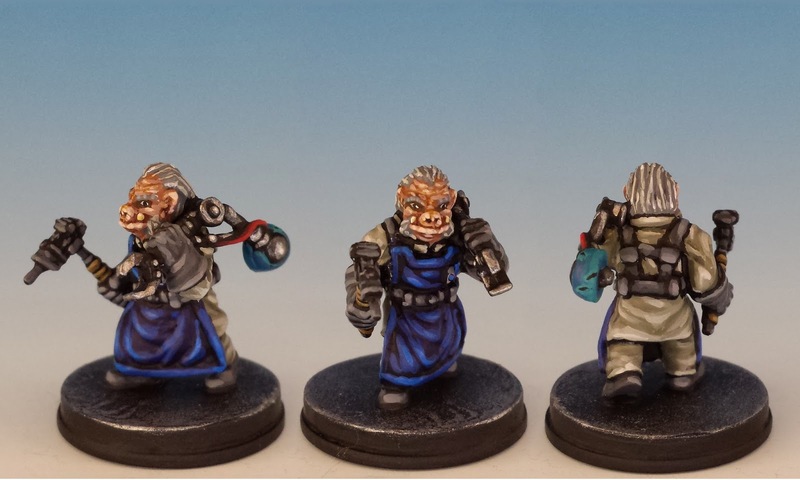 I painted my regular Ugnaughts in the same colour scheme as the old Kenner action figures -- it's my conservative nature. But I find these Oompa-Loompas aggravating because their main in-game power consists of creating "junk droids" that can be used as distracting fodder. 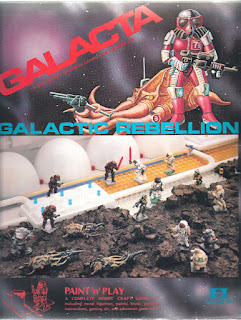 Good and well -- but why is there no miniature for the junk droid? There's a little cardboard marker in the box... but only one, even though there are three Ugnaughts. It feels slapdash. 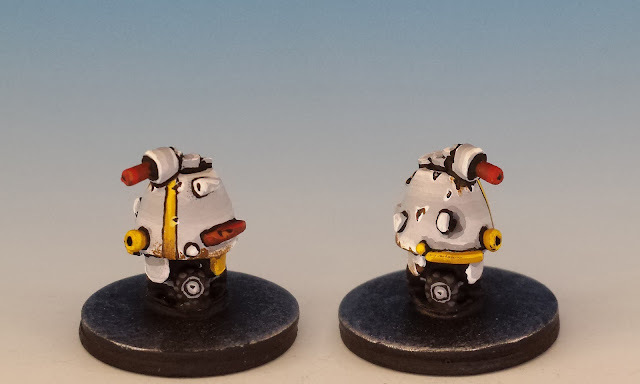 I decided to make my own Junk Droid, using some of the robots from the old range of Galacta miniatures originally sculpted by Heritage Miniatures in the late 1970's and currently produced by Classic Miniatures. I love Galacta and am looking forward to painting more of the models when I get some time. 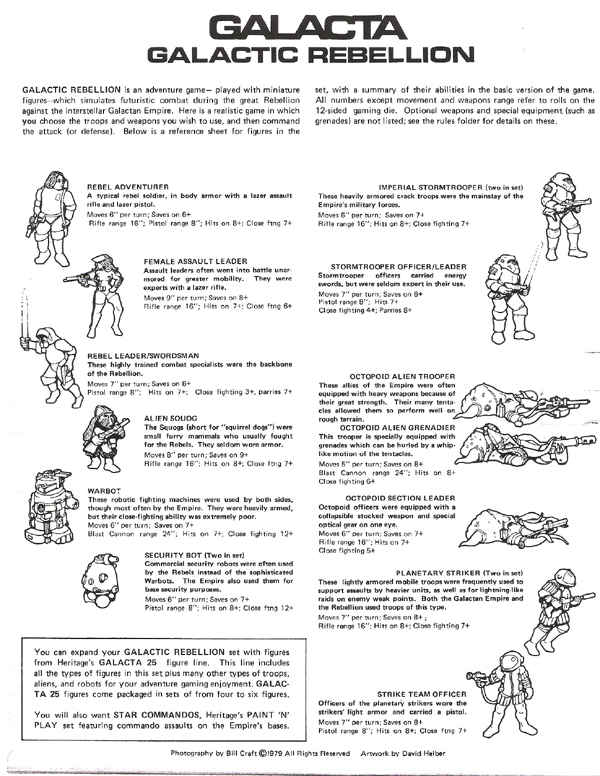 They were an early knock-off of Star Wars, so it's only appropriate to enlist them for Imperial Assault. My junk droid is a Security Bot from the "Galactic Rebellion" paint-and-play boxed set. Finally, there's the Bespin Wing Guard. Like the Ugnaughts, they are well-sculpted and detailed, and will certainly help to create the atmosphere of Cloud City. I like their understated uniforms, with the gold piping and the red cuffs. 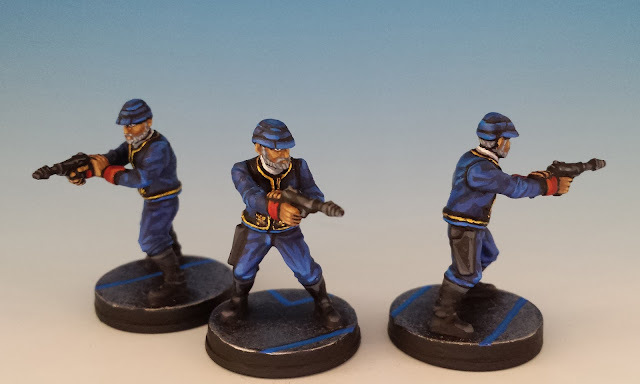 Sometimes simple is best -- they were fun and easy to paint. Like alway, fantastic work! I'm under spell of your painting! Thanks MK - from you that's a high compliment. Thanks Orlygg. 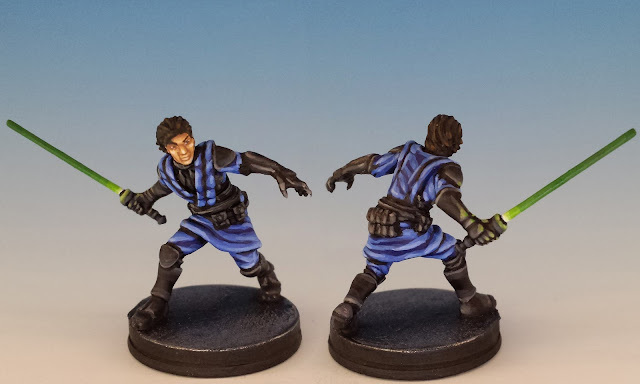 I know my style isn't too everyone's tastes (and I'm not sure it harmonizes as well with grittier themes like Warhammer 40K) -- but I like making these SW miniatures bright and vivid. Anyway, I'm back to painting some old Citadel minis and am looking forward to posting about them soon. Ithorian fashion isn't everyone's cup of tea. I see nothing wrong with her dress. Ostentatious but totally befitting her station. Your combined conversion work and painting chops have produced a fantastic result. I like it. Quite right. 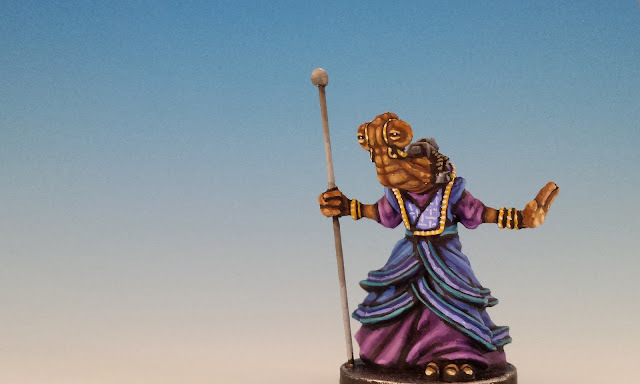 Ithorians do like their frocks frilly and fabulous. 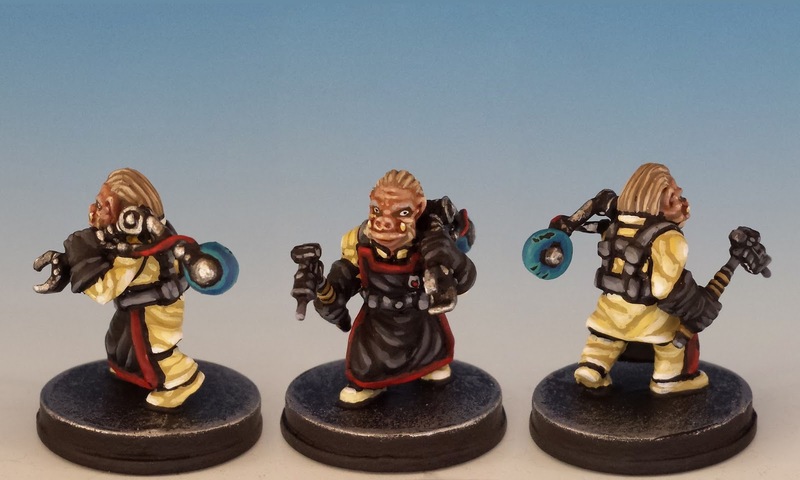 Your interpretation of these minis is wonderful. Like Orlygg, I thought the Ithorian was just that way, so superb conversion! I like the junk droid, I'll be keeping my eyes out for something similar.